In the category of “totally delightful calendar news,” March is National Noodle Month and we are HERE for it. We are also here for you with a list of our nine favorite noodles in L.A., from gnocchi to gizzard noodles. Read on for your starter kit for celebrating this month in style — delicious, delicious style. It’s an elaborate and time-/labor-intensive three-day process from start to finish, it’s no wonder that chef Casey Lane’s pasta alla piastra with Bolognese sauce sells out most nights at his West Hollywood eatery. 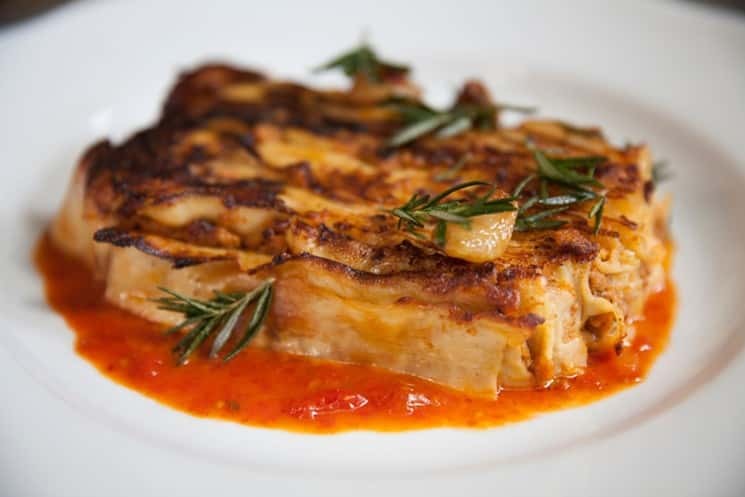 The 100-layer lasagna is made in the traditional Emilia-Romagna style with layered sheets of pasta in between sauce, which makes for a lasagna that is not overly heavy or cheesy. It is the perfect layered baked pasta served with an eight-hour Bolognese made of veal (braised in milk with light tomato) and pork. As for the “100 layers,” the dish is made with 50 sheets of pasta and 50 layers of Bolognese, and then baked. To finish the dish, Lane uses a piastra(hot sheet of metal) to sear the lasagna sheet so it’s caramelized and crispy on top, and then serves the lasagna over a simple tomato jus. 623 N. La Peer Drive, West Hollywood; (310) 691-1600, vialedeiromani.com. Take a look at the menu at Evan Funke’s Venice trattoria and you’ll see “Tutta la Pasta Fatta in Casa,” which means all pasta is made in-house. It should be no surprise that Felix’s pasta is on this list of L.A.’s best noodles. While everything here is wonderful, the figatoni all’amatriciana with guanciale, pomodoro and pecorino romano has a special place in the heart of the regulars at Felix. Simple and vibrant, with lingering porky flavors, it likely will win your heart, too. 1023 Abbot Kinney Blvd., Venice; (424) 387-8622; felixla.com. If you’re going to include a lunchtime-only pasta bar (that’s open only Wednesdays to Saturdays) in a list like this, it had better be excellent. Cento is. Located inside Mignon in DTLA, with a weekly changing menu, Cento is both affordable — most pasta dishes run $15 and under — and delicious. Recent guest favorites include the gnocchi and stunning beet-red spaghetti. Whatever you order, you’ll love it. 128 E. Sixth St. (inside Mignon), downtown; (213) 489-0131, centopasta.com. Ayara, a charming family-run restaurant, offers authentic modern Thai for both casual lunch diners and lovers of modern Thai food. The pad thai is the best of all worlds, with its classic thin rice noodles, cooked a bit firmer than most other restaurants choose. 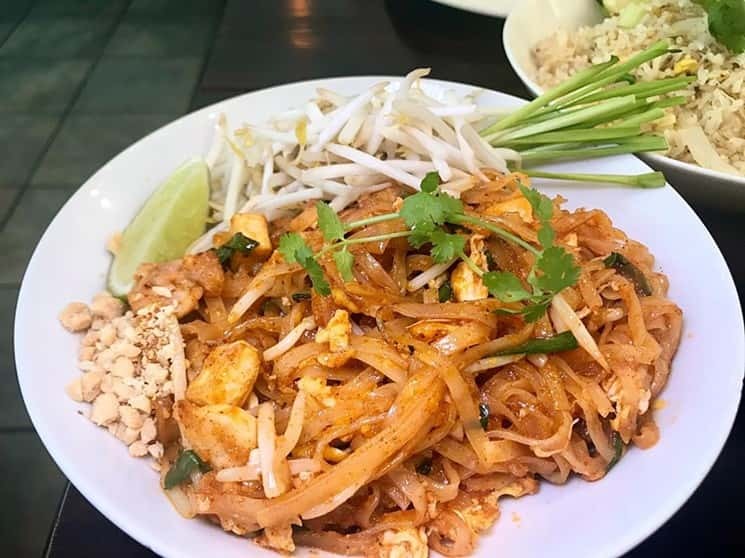 If pad thai is a favorite of yours, don’t miss Ayara’s. 6245 W. 87th St., Westchester; (310) 410-8848, ayarathai.com. Lao Xi is both the name of this restaurant and the nickname for Shanxi, the province of China where the cuisine of Lao Xi Noodle House originates. It is said that if you don’t know how to make noodles in Shanxi, you are automatically unmarriageable. The flagship Wife Noodles are so named because ­Tao and Li, the owners, were simply university colleagues until Li made this dish for Tao. Now they’re married. Served with bok choy, this lovely dish is topped with pork belly, tomato, egg, and ground pork coated with fermented soy. 600 E. Live Oak Ave., Arcadia; (626) 348-2290. You may have tried dan dan mian before. It was probably weirdly gloopy and peanut buttery. The Chong Qing version uses finely crushed peanuts instead of the more popular peanut butter, preventing the unpleasant gloop while maintaining the integrity of the sauce. Add in the traditional numbing spice and you’re in excellent shape. And, at $7 for a generous portion, you can afford to get another order to go for tomorrow’s lunch, or tonight’s late-night snack. No judgment here. 708 E. Las Tunas Drive, San Gabriel; (626) 374-1849. The Chinese word for noodles is “mian.” You will find excellent mian at Mian. We especially recommend the gizzard noodles, which you can order to your preferred level of spice, up to level five, the spiciest. Even those who aren’t huge fans of gizzard or liver (also in the dish) have left internet reviews singing the dish’s praises. The snappy noodles and the richly umami crunchy gizzards make a memorable pairing, especially with the creaminess of the added liver. 301 W. Valley Blvd., Suite 114-115, San Gabriel; (626) 693-6888. Otafuku is better known for its soba but makes both udon and soba in-house. 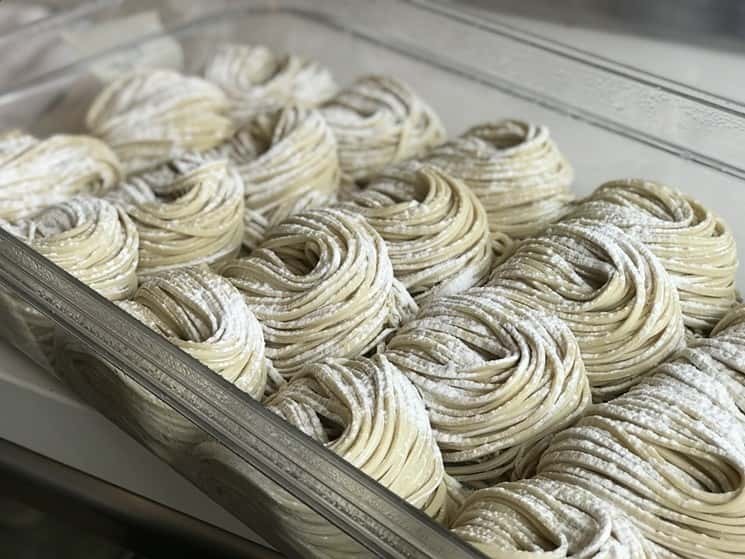 We’ve called them the best soba in L.A. County and we’re sticking to it—not only do they make a few traditional kinds of soba with both buckwheat and wheat flour, they also make a 100% buckwheat version, called kikouchi, which is more rare and much harder to make without the wheat gluten as a binder. For soba, it’s not particularly cheap, running $9-$12 for a lunchtime portion, but you’ll be glad you went. 16525 S. Western Ave., Gardena; (310) 532-9348. We’ve mentioned Okiboru’s dipping ramen before, and for good reason. While tsukemen, or dipping ramen, is still fairly new in the United States, having a restaurant like Okiboru as one of its champions bodes well for the dish — all the noodles are made in-house and are adjusted to suit the broth. Plus, there’s non-dipping ramen served, too (which you may be more used to), if you want to play it safe, including a truffle version. But, try the tsukemen. Trust us — it’s worth your time: Watch the video below. 635 N. Broadway, Chinatown; (213) 988-7212; okiboru.com.